The Bermuda Gospel Explosion, a gospel concert showcasing Bermudian artists, will be held on June 25 at Heritage Worship Center. In the first of a series of profiles of the event’s performers, we showcase 26-year-old Olivia Hamilton. “My nana, Rev. Ruby Smith motivated me to get involved. Whatever God has for me I will rock for that. I am feeling another calling with Acting. “I am most grateful for the support that I have received from my fellow Bermudians but there is a group of women and they follow me wherever I am singing. I sang at a funeral the other day and they were there. My nana never misses a performance; I get a lot of support and I am thankful for it. 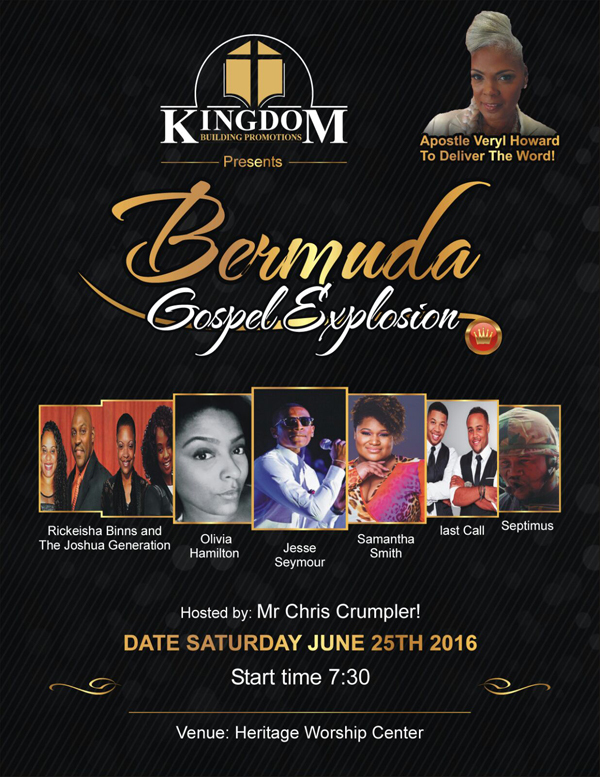 The Bermuda Gospel Explosion will be presented by Kingdom Building Promotions on June 25 at Heritage Worship Center, hosted by Chris Crumpler and featuring past Bermuda Idol winners Olivia Hamilton, Samantha Smith, and winner of the 2016 Bermuda Idol, Jesse Seymour. Other local artists include Septimus, Rickiesha Binns, The Joshua Generation, and gospel duo Last call. Tickets cost $35 in advance and $40 at the door and can be purchased from Hamilton Pharmacy or by contacting Kingdom Building Promotions representative Eron Hill at eronhill@live.com or via Whatsapp on 518-6576.